The American Institute of Intradermal Cosmetics is the first training institution devoted specifically to research and education for permanent cosmetics professionals. It is also the largest permanent makeup training program in existence, with our principal campus located in Arlington, Texas, and affiliate programs located throughout the world. Students will learn how to apply everything from permanent makeup to microblading at our school through hands-on learning. 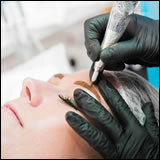 Premier Pigments provides a high quality hands-on permanent cosmetic experience. For more information about signing up for classes, call customer service at 800.642.1096. Keep in mind that calls may be monitored or recorded for quality assurance purposes. *These Items are also available in Spanish. Learn the fundamentals of the art of permanent cosmetics. This information-packed class includes step-by-step instructions, hands-on procedures and live demonstrations of permanent eyebrow, eyeliner, and lip procedures. Lectures cover health considerations, color selection, insurance, general application, tips for beginning technicians, consultation topics, communication, marketing, and procedure techniques. Daily testing ensures you understand and retain the concepts and techniques you are learning. We provide ongoing technical support to you after your graduation to ensure you master the skills necessary to become successful in your new career. Learn the fundamentals of eyebrow design, including how to measure, color, shape and space brows that will enhance any face shape. This information-packed class includes step-by-step instructions, hands-on procedures and live demonstrations of permanent eyebrow. Lectures cover health considerations, color selection, insurance, general application, tips for beginning technicians, consultation topics and procedure techniques. Daily testing ensures you understand and retain the concepts and techniques you are learning. We provide ongoing technical support to you after your graduation to ensure you master the skills necessary to become successful in your new career. An AIIC certified instructor will supervise you as you perform procedures for eyebrows, lip and eyeliner, including color corrections and touch ups, all in a small group setting. This two-day clinic is the perfect opportunity for the beginning technician to increase their confidence and quickly launch their career. This hands-on seminar is also a great refresher course for anyone who has been in the field and wants to enhance their skill level. Consider attending this class the same week you attend the Specialty Hands-On Clinic. Prerequisites: Basic Course Certification & Bloodborne Pathogen Certification. The AIIC Specialty Hands-On Clinic is recognized throughout the world as the ultimate educational experience for practicing technicians. This intense three-day course covers lectures on advanced techniques, paramedical applications, step-by-step instructions for areola coloring; lectures also include color theory, color correction, and tips for eliminating time and touch-ups. Business building and marketing techniques, as well as working with physicians are also popular topics. You will participate in hands-on procedures, from eyeliner (including mucosal), to hairline stroke eyebrows, and full lip color procedures. Consider attending Wednesday - Friday the same week of our Cosmetic Hands on Clinic. Prerequisites: Basic Course Certification & Bloodborne Pathogen Certification. For more information about signing up for classes, call customer service at 800-642-1096. A certified master instructor will educate professionals in mechanical skin exfoliation on state-of-the-art equipment. This comprehensive course encompasses both theory and hands-on teaching methods. You will learn about multiple opportunities of the profession of microdermabrasion and will discover the benefits of the procedure. Client consultations, topical ingredients and post-treatment instruction are a few topics that will be discussed during this course. Our eyelash extension class introduces you to the fastest growing trend in the beauty industry. Eyelash extensions are beautiful! Topics include: eyelash selection, application technique, product demonstration, touch-up procedures and removal. Multiple marketing strategies are also discussed. Course includes: lecture, demonstration, reference manual and certificate. This class is also available in Spanish. An essential class for those technicians wanting to move their practice to a new level, or those who just want to explore the advantages of a more powerful machine. This class will offer you an opportunity to try a variety of machines that are commonly used by seasoned technicians. You will work with machines that are designed to perform advanced procedures such as areolas, scar camouflage, body art, and more. Most women apply color to their cheeks everyday to give their face a healthy youthful appearance. Imagine how excited they will be to find out that they could have this look all of the time. Take this highly intensive course and learn how to perform blush procedures that are designed as a natural enhancement. Animal Artistry is a new and exciting profession! This class will teach you how to market animal artistry to veterinarians, registered breeders, show specialists, ranchers and the general public. Learn various applications and benefits of permanent make-up for animals; including registration and identification markings, various cosmetic procedures for show animals, and targeting and tattooing areas for the purpose of cancer prevention. Anesthetics, machines, techniques and various applications will be covered in this class. Other topics include: consent, considerations, procedure pricing, consultations, and color selection. Areola pigmentation can be used for a variety of procedures including scars from breast implants, breast reductions, or reconstruction. This class is also available in Spanish. 80 percent of all women over 18-years-old have stretch marks. Stretch mark strategies is a course designed to isolate this subject from other scar revisions, completely inform you on technique, and take away your hesitations of performing this procedure. This class is also available in Spanish. Join the rewarding field of paramedical scar revision. You will go step-by-step from the initial consultation exam and color testing to the final color application. This course includes case studies, manual, demonstration, hands-on training and certificate. Most women apply color to their cheeks everyday to give their face a healthy youthful appearance. Imagine how excited they will be to find out that they could have this look all the time. Take this highly intensive course and learn how to perform blush procedures that are designed as a natural enhancement. Learn how to create beautiful hairline strokes that work to add dimension and definition to your eyebrow procedures. This advance permanent makeup course will cover everything you need to know in order to create hairline stroke eyebrows that look real, including machines and needle selections, artistic technique, pigment placement with multiple shades to create depth and texture. This course is a must for any technician that wants to improve on the simulation of hairline strokes. This class includes lecture, manual, demonstration, hands-on training, and certificate. Implantation of subtle shadowing in the lash line can mimic hundreds of tiny eyelashes, this is popular among men as well as women. Additional shadowing of color can create a soft enhancement of the eye or a bold line can be achieved, depending on the desired result. This class will cover step-by-step eyeliner application, approaching your procedure, appropriate anesthetic application, keeping your clients eyes closed, and proper stretching techniques. Get that extra assurance that you are providing the best eyeliner service possible with optimal results. An AIIC Instructor will teach you new innovative techniques for achieving vibrant lip color in minutes. You will learn the secret techniques to perform beautiful, vibrant, smooth lip color in half the time it takes you currently. This class will cover technique, color selection, product knowledge and tips for vibrant lips in minutes. You will not want to miss this fast moving, dynamic, hands-on workshop that is guaranteed to change your lip procedures forever. Course includes lecture, reference manual, demonstration, hands-on training and certificate. Finally, a class designed to prevent mistakes before they ever happen. This confidence boosting course will act as a refresher for both rookie and veteran technicians. Learning how to avoid costly mistakes and reducing unsatisfactory results will increase your clientele, build your reputation and reduce the headaches of disgruntled customers. Course includes lecture, reference manual and certificate. Mucosal eyeliner is a great addition to any permanent cosmetic eyeliner procedure. This course covers fact and fiction regarding mucosal eyeliners, including: artistic technique, pigment placement, machines and needle size selection. Other topics include: numbing techniques, corneal abrasions, anatomy of the eye, migration, the cause, and how to avoid it. You will learn how to compliment the iris by selecting the proper colors to add depth or vibrancy to the eyes. Join the rewarding field of paramedical scar revision. We will take you step-by-step from the initial consultation exam and color testing to the final color application. Eyelash Perming is a simple 45-minute procedure that can increase your income dramatically; clients are amazed with beautiful curled lashes and return every two to three months for this procedure. These services are presented for both men and women and can be offered to your clients during a facial or prior to permanent makeup. This course includes an Eyelash Perm Kit that will do approx 50-60 procedures, lecture, hands on training, a reference manual, and certificate. This class is also available in Spanish. Join our instructors as they teach you how to create beautiful eye accents using multiple colors that will enhance your client’s natural beauty. You will also be taught how to compliment the iris by selecting proper colors that add depth and vibrancy. This class is also available in Spanish. Increase your client base by learning how to treat and care for skin of women from all nationalities. This course will cover color selections for African American, Asian, Hispanic, Indian and other skin types of color. Threading is the hottest and most natural way to remove unwanted hair using a cotton thread. This is an ancient method of depilation used in many countries. The delicate procedure is suitable for even the most sensitive skin types and is highly recommended as an excellent option instead of waxing or tweezing. Master the exact steps necessary to completely pre-deaden all procedures: The L.I.N.D.A. technique is a revolutionary method that ensures your anesthetics has reached peak performance before you touch your client’s skin. This method allows your client to maintain a comfort level that will enable you to implant more color with less trauma to the skin. You will also learn the crucial steps you need to take and the times necessary to achieve pain-free permanent cosmetic procedures. This course is a must for any technician who has never had professional eyebrow training. It does not matter if you are young or old your eyebrows are one of the most expressible features on your face. Defining them will help make your eyes appear lifted and can help make you appear younger. You will learn how to measure, shape and space brows with and without stencils that will enhance any face shape. Take the guesswork out of designing brows by attending this information packed course that will change your brow procedures and you can even take this course in Spanish. Do you know how to correct blue lips? Orange eyebrows? Or a distorted lip liner? You will leave this workshop with the techniques and skills necessary to improve less-than-desirable procedures. Come and learn color theory and color harmony as you study contrast and dominance, proportion and intensity. We will examine contextual color basics and the effect on our perception of color. You will then be given the opportunity to take your practice to the next level by overcoming the challenges of correcting the unsuccessful work of your competitors and/or covering inferior iron-oxide colors. Have you ever wondered how you could increase your revenue without having to create a whole new clientele? This exciting new course will give you innovative ideas and resources to increase your revenue all year long. You will learn about body wraps, teeth whitening, non-surgical face-lifts, light therapy, anti-aging products and more. Learn how to incorporate optional procedures to all your clients and attract new clients with these new and exciting treatments and maybe even be able to make a little bit of money on the side. For thousands of years, women have used a range of substances from sour milk to fermented grape skins to improve their complexions. Today, we use different acids to exfoliate the outer layers of skin and improve its appearance. This class will distinguish the chemical differences between alpha-hydroxy and beta-hydroxy acids, retinoids, and various vitamin combinations for the skin. By incorporating a synergistic approach to enhance your treatments, your clientele will see better results. Course includes: lecture, reference manual, demonstration, hands on training and certificate. Experience the latest and greatest technologies in equipment and how to use combined and layered techniques for those who want that “lifting and tightening facelift effect” without surgery. Treatments and protocols will be discussed; topics of treatment will include acne, rosacea, hyper-pigmentation, and anti-aging. Demonstrations include LED red light lift therapy, LED blue light therapy, microcurrent, facial rejuvenation and skin renewal systems. This course is a must for every technician! Attending this course will teach you how to prevent mistakes before they ever happen. Study how to take the guesswork out of color selection by learning how to analyze your client’s complexion and determine warm or cool undertones. In this course, you will learn how to incorporate these master techniques and optional procedures with new and exciting treatments and market them to all of your clients to increase your income dramatically. You will learn how to incorporate these optional procedures with new and exciting treatments and market them to all of your clients to increase your income dramatically when you take this course. This two day intensive class will introduce you to the rewarding field of paramedical procedures. An AIIC Instructor will cover everything you need to know to start you on your way to performing successful procedures. You will go step-by-step from the initial consultation to setting realistic expectations, color selection, and testing to the final color application. Learn our industry’s newest art form, micro hairline strokes. You will learn how to create beautiful hairline strokes with hand tools and digital machines alike. This technique can be used not only for eyebrows, but also for scalp camouflage hairline strokes. Discover premier’s latest innovative tool to simplify your color decisions. Skilled practitioners offer new tips and secrets for proper color selection and application when dealing with Asians, Hispanics, Ethnics, and Caucasians. Learn to analyze your client’s complexion, determine warm or cool undertones and ensure a flawless final result. Take the guesswork out of color selection as you delve into: saturation, contrast and color balance. From this course, you will study the art of color layering, color mixing, and color correction as well as gain confidence in finding the ideal color that balances your client’s requests with the color that best suits his or her skin type. Classes are limited in size and prices are subject to change. Please call to confirm availability before you make other arrangements. Call us for more information today!